1Department of Horticulture, Science and Research Branch, Islamic Azad University, Tehran, Iran. 2Medicinal Plants Research Center, Institute of Medicinal Plants, ACECR, Karaj, Iran. 3Agricultural College and Medicinal Plants Research Center, Shahed University, Tehran, Iran. Background and objectives: Menthol and menthone are two important components in the essential oil of peppermint(Mentha piperita L.) which are commercially used in the pharmaceutical industries. This study has presented the allometric ratio of menthol and menthone to pulegone affected by the induction of bioregulators. Methods: The experiment was conducted in controlled condition based on completely randomized design (CRD) in three replications. The plants were subjected to different bioregulator treatments including distilled water; 5 %v/v methanol; 40 ppm GA3 (gibberellic acid) + 5%v/v methanol; 40 ppm IBA (indole butyric acid) + 5%v/v methanol, and 40 ppm GA3 + 40 ppm IBA + 5%v/v methanol. Essential oils analysis were performed using different methods of gas chromatography and gas chromatography-mass spectroscopy. Results: The application of 40 ppm IBA + 5%v/v methanol increased the essential oil content. With the use of bioregulators, the content of menthol and menthone increased and the amount of pulegone was conversely reduced. The lowest content of pulegone was measured in the treatment with 40 ppm GA3 + 40 ppm IBA + 5%v/v methanol. Allometric analysis of components showed that the ratios of menthol/pulegone, menthone/pulegone, and (menthone+menthol)/pulegone increased by bioregulators application, especially with 40 ppm GA3 + 40 ppm IBA + 5%v/v methanol. Conclusion: Using plant bioregulators could be a suitable procedure to increase pro-health potential through increasing the amount of menthol with decreasing the content of pulegone in the essential oil. It is possible that the bioregulators were able to convert pulegone to menthol and menthone. Kligler B, Chaudhary S. Peppermint oil. Am Fam Physician. 2007; 75(7): 1027-1030. McKay DL, Blumberg JB. A review of the bioactivity and potential health benefits of peppermint tea (Mentha piperita L.). Phytother Res. 2006; 20(8): 619-633. Herro E, Jacob SE. Mentha piperita (peppermint). Dermatitis. 2010; 21(6): 327-329. Witkowska D, Sowinska J. The effectiveness of peppermint and thyme essential oil mist in reducing bacterial contamination in broiler houses. Poult Sci. 2013; 92(11): 2834-2843. Nair B. Final report on the safety assessment of Mentha piperita (peppermint) oil, Mentha piperita (peppermint) leaf extract, Mentha piperita (peppermint) leaf, and Mentha piperita (peppermint) leaf water. Int J Toxicol. 2001; 20(3): 61-73. Kolassa N. Menthol differs from other terpenic essential oil constituents. Regul Toxicol Pharmacol. 2013; 65(1): 115-118. Bogel-Łukasik E. Selective catalytic conversion of pulegone in supercritical carbon dioxide towards natural compounds: carvone, thymol or menthone. J Supercrit Fluids. 2015; 99(15): 121-128. Cassileth BR, Yeung KS, Gubili J. Herb-Drug interactions in oncology. 2nd ed. New York: People’s Medical Publishing House, 2010. Sharafzadeh Sh, Zare M. Influence of growth regulators on growth and secondary metabolites of some medicinal plants from Lamiaceae family. Adv Environ Biol. 2011; 5(8): 2296-2302. Nourafcan H, Sefidkon F, Khalighi A, Mousavi A, Sharifi M. Study on effects of IAA and BAP on chemical composition and essential oil content of lemon verbena (Lippia citriodora L.). J Herbal Drugs. 2014; 5(1): 25-32. Singh P, Mishra A. Influence of gibberellins and ethereal on growth, chlorophyll content, protein, enzyme activities and essential monoterpene oil in efficient genotype Mentha spicata var. MSS-5. J Med Aromat Plant Sci. 2001; 22(3): 283-286. Bose SK, Yadav RK, Mishra S, Sangwan RS. Effect of gibberellic acid and calliterpenone on plant growth attributes, trichomes, essential oil biosynthesis and pathway gene expression in differential manner in Mentha arvensis L. Plant Physiol Biochem. 2013; 66(20): 150-158. Reda F, Abd El-Wahed MSA, Gamal El-Din KM. Effect of indole acetic acid, gibberellic acid and kinetin on vegetative growth, flowering and essential oil pattern of chamomile plant. World J Agri Sci. 2010; 6(5): 595-600. Bai YR, Yang P, Su YY, He ZL, Ti XN. Effect of exogenous methanol on glycolate oxidase and photorespiratory intermediates in cotton. J Exp Bot. 2014; 65(18): 5331-5338. Zbiec I, Karezmarczyk S, Padsiadlo C. Response of some cultivated plants to methanol as compared to supplemental irrigation. Electronic J Polish Agric Univ. 2003; 6(1): 137-142. Mehrabi S, Mehrafarin A, Naghdi Badi H. Clarifying the role of methanol and amino acids application on savory (Satureja hortensis L.). Annals Biol Res. 2013: 4(4): 190-195. European Pharmacopoeia Commission. 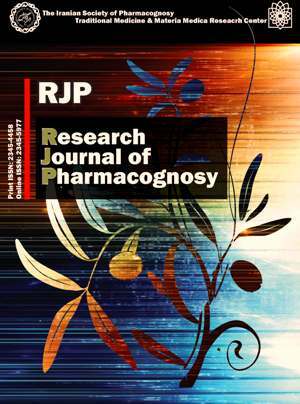 European Pharmacopoeia. 5th ed. Strasbourg: Council of Europe, 2005. Adams RP. Identification of essential oil components by gas chromatography/mass spectrometry. Carol Stream: Allured Publishing Corporation, 2001. Naghdi Badi H, Labafi MH, Ghavami N, Qaderi A, Abdusi A, Aghareb Parast MR, Mehrafarin A. Phytochemical and morphological response of Thymus vulgaris L. to foliar application of biostimulants based on amino acids and methanol. J Med Plants. 2015; 14(2): 130-139. Khosravi E, Mehrafarin A, Naghdi Badi H, Khosravi MT, Hajiaghaee R. The phytochemical response of lemon balm (Melissa officinalis L.) to methanol and ethanol hydroalcoholic solutions. International Congress on Natural Products Research (ICNPR). 2012 Jul 28 -Aug 1; New York, USA. Hassanpour Aghdam MB, Haji Samadi Asl B, Khalighi A. Gibberellic acid foliar application influences growth, volatile oil and some physiological characteristics of lavender (Lavandula officinalis Chaix.). Rom Biotechnol Lett.2011; 16(4): 6323-6327. Yazdifar SH, Moradi P, Yousefi Rad M. Effect of foliar application of methanol and chelated zinc on the quantities and qualities yield of marigold (Calendula officinalis L.). J Appl Environ Biol Sci. 2015; 4(12): 170-176. Moradi P, Ebadati Esfahani R. Effect of foliar application methanol on the quality and quantity of Artemisia dracunculus L. Electronic J Biol. 2016; 1(3): 24-29. Bagheri HR, Ladan Moghadam AR, Afshari H. The effects of foliar application of methanol on growth and secondary metabolites in lavender. Int Res J Appl Basic Sci. 2014; 8(2): 150-152. Silva S, Sato A, Lage CLS, Gil RAS, Azevedo DA, Esquibel MA. Essential oil composition of Melissa officinalis L. in vitro produced under the influence of growth regulators. J Braz Chem Soc. 2005; 16(6): 1387-1390. Lopes V, Rodrigues Souza B, Dahis Ramalho M, Debora Zacarias D, Patricia Souza D, Santos Matos F. Initial growth of eucalyptus plants treated with gibberllin. Afr J Agric Res. 2015; 10(11): 1251-1255. Asrar Z. Terpenoids and gibberellic acids interaction in plants. Life sciences, agricultural and biological sciences. In: Montanaro G and Dichio B. Eds. Advanced in selected plant physiology aspects. Rijeka: Intechopen Publications (InTech), 2012. Bhagya HP, Raveendra YC, Lalithya KA. Role of growth regulator in production of essential oil in aromatic crops. Hort Flora Res Spectrum. 2015; 4(2): 179-181. Pilehvari Khomami R, Safarzadeh Vishkaei MN, Sajedi N. Effect of methanol and zinc application on peanut qualities and quantities characteristics in Gilan region. New Findings Agric. 2008; 2(8):339-351. Sajedi Moghaddam S, Mehrafarin A, Naghdi Badi H, Pazaki AS, Gavami N. Evaluation of phytochemical performance of thyme under hydroalcohol spraying. J Med Plants. 2012; 11(4): 130-139. Soad MMI, Lobna Taha S, Farahat MM. Vegetative growth and chemical constituents of croton plants as affected by foliar application of benzyl adenine and gibberellic acid. J Am Sci. 2010; 6(7): 126-130. Baydar H. Effects of gibberellic acid on male sterility, seed yield, oil and fatty acid syntheses of safflower (Carthamus tinctorius L.). Turk J Biol. 2000; 24(3): 159-168. Mahmoud SS, Croteau RB. Menthofuran regulates essential oil biosynthesis in peppermint by controlling a downstream monoterpene reductase. Proc Natl Acad Sci. 2003; 100(24): 14481-14486. Hassanpouraghdam MB, Tabatabaie SJ, Nazemiyeh H, Aflatuni A. N and K nutrition levels affect growth and essential oil content of costmary (Tanacetum balsamita L.). J Food Agric Environ. 2008; 6(2): 145-149.